Michael Barton of The Dispersal of Darwin got a nice write-up in The Billings Gazette for the work he did at Yellowstone National Park's Heritage and Research Center a while back when he was working as an intern there. Barton found that use of religious language in descriptions of the park was common during the Romantic movement, a reaction to the 18th century's Enlightenment that stressed science and objectivity. Romanticism was about emotions and imagination. It was a period that produced such American literary giants as Ralph Waldo Emerson, Walt Whitman and Edgar Allen Poe. But it also carried over to the writings of travelers to Yellowstone and is found in newspaper accounts, journal entries and letters sent to family and friends. Barton catalogued the references in more than 50 documents - everything from short journal reminiscences to published books and U.S. Geological Survey writings. 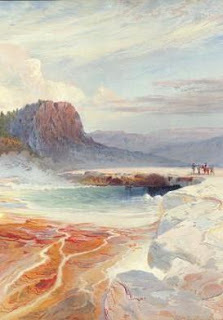 Barton said he saw scientists in the 1870s steer away from Romanticism and be more descriptive about what they saw, rather than describing sites in emotional terms. "They started to write more about the height of a geyser, the times of eruptions rather than the raw emotional scenes," he said. Perhaps the best part of the research, Barton said, was having access to the park's extensive archive collection in its newly built facility, to view the original watercolors of artist Thomas Moran stored there and to travel to some of the places he'd read about. Thanks John for the plug, I just now saw it! You're welcome (and I took the occasion to switch the link to your new site).